^ Cheers mate, figured as much. Same deal with ML 300 I presume? Hmm, Richard Attenborough made all of us believe it's the lionesses that actually do all the real work, again you proved him wrong Simba Frank. Thanx for the AK update -and for the updates on five of the Lions too. BTW, is there to be an ML-BMV update too, I mean; before we all make the 'Big Leap' to Fx3? Are you going to bring out a version that's compatible with FF3? I've just upgraded to FireFox 3 and found that Aluminium Kai 2 has been disabled. As it's the only theme I like (really! 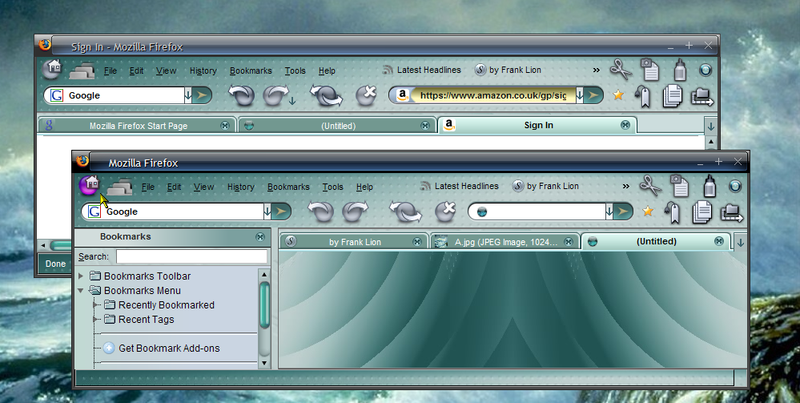 ), I'm seriously considering uninstalling FireFox 3 and going back to FF2, just so I can use your excellent theme. So, if you're bringing out a version that's compatible with the new firefox, I can wait. Otherwise, I might as well go back to FF2 now and enjoy browsing. Hi davoid#1, I am indeed bringing out a new version of AK2 for Firefox 3 and the versioning process for it is already well underway. http://franklion.co.uk/ from time to time, and you'll see when the new version is out. ...just a little news update for AK2 users. All the other themes are now done, well, they have been for a while but stuff has to be well tested before it goes out. Anyway, AK2 was a bit of a special case, as it doesn't use my own theme code engine. The huge changes for Firefox 3 meant that versioning up a theme, whose coding is totally different to my own, was going to be a huge job! So...I've taken a Firefox 3 version of Metal Lion Vista and turned it into AK2, by replacing with the AK2 original graphics and adjusting the code to suit. Still a fair sized job, but is going much more smoothly than I thought. You will not know the difference - I used screenshots of AK2 on Firefox 2 to work from and the stuff is right, to the pixel. btw Moderators... please keep this post at Theme Development. Good news indeed, Frank; this is a great theme. Looking forward to the release. I've added a theme option, so that it will look like this in a new blank tab and not that grim blank page. Just paste the following anywhere into your userContent.css, Save and restart Firefox. As I mentioned above, this is not the original code engine for this theme. What you are actually seeing is, er, Metal Lion Vista...which I then converted to AK2. I've added some new images, obviously, for Firefox 3, but all are in keeping with my original design, so you will not get any shocks, haha. I believe I did mention to a few of you that I would bring this one out before Christmas and I figured that now would make a nice Christmas present to many of you. When I say 'you', I'm thinking more about the people that write to me, not so much as the few people that post in these forums these days. I know why I don't post, but MozillaZine generally seems really dead these days... so, maybe we all think like the Borg or something, dunno. Anyway.... a very merry and Happy Christmas to all my friends, both here and elsewhere. May all your dreams come true. BTW I've got a bit of time off after Christmas and maybe, just maybe, might do a new theme ...dark, I think. ....some reading this? be afraid, be very afraid. Great! Excellent timing too, now I have nothing left to wish for and Santa can have an early night. Thanx Frank and an extra big helping of Christmas pudding for you! Am reading this. Like dark. Not afraid. Bring it on. Haha.....someone just mentioned to me that the top of the Options window was very slightly different to that of the Firefox 2 version. So...I've just changed it. If you have downloaded AK2 longer than a couple of minutes ago, then just install it again to get the 'latest look'. See the advantage of hosting your own stuff? Well Frank, this is a new one for me and I'm loving it. I've been checking your site since you left us a 'clue' in the last 24. The blank tab option's doggone gorgeous....definitely lush! mightyglydd wrote: Well Frank, this is a new one for me and I'm loving it! Yes, I must say I am quite surprised at just how delighted many users are about this release....as this sneak footage of two of them reveals! Ahhh Frank. That's ^ brill mate.